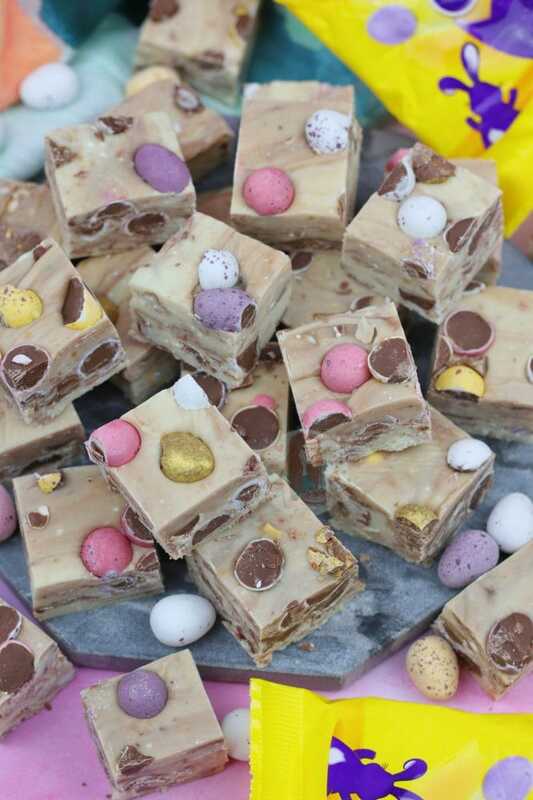 Delicious & scrumptious Mini Egg Fudge that is seriously easy to make at home, no boiling or sugar thermometers involved! So, its less than a Week away till its Easter 2016… so its time for my last few delicious Easter related recipes of the year. I actually find this a little tragic, as I LOVE Easter chocolates such as Mini Eggs & Creme Eggs and it breaks my heart a little that they’re going to be off the shelves in less than a week. But anyway, an easy recipe today that even the worlds biggest fudge novice can make & enjoy as its not like normal fudge.. its cheats fudge! 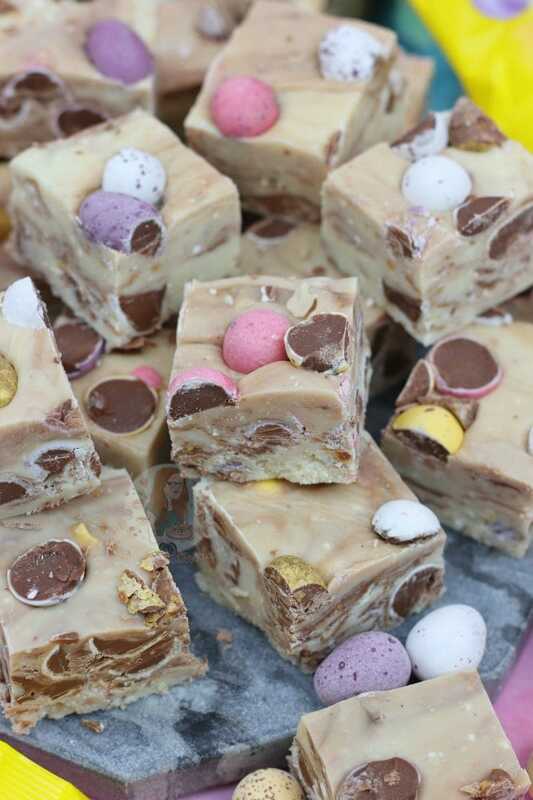 Normal fudge is something I would consider is similar to my Easter Fudge, whereas cheats fudge is just SO EASY to make! By cheats fudge, I do not by any means mean that its low fat.. or sugar free, because LOL no its not.. I mean that its incredibly easy to make, and you don’t need a sugar thermometer to make it like normal fudge. 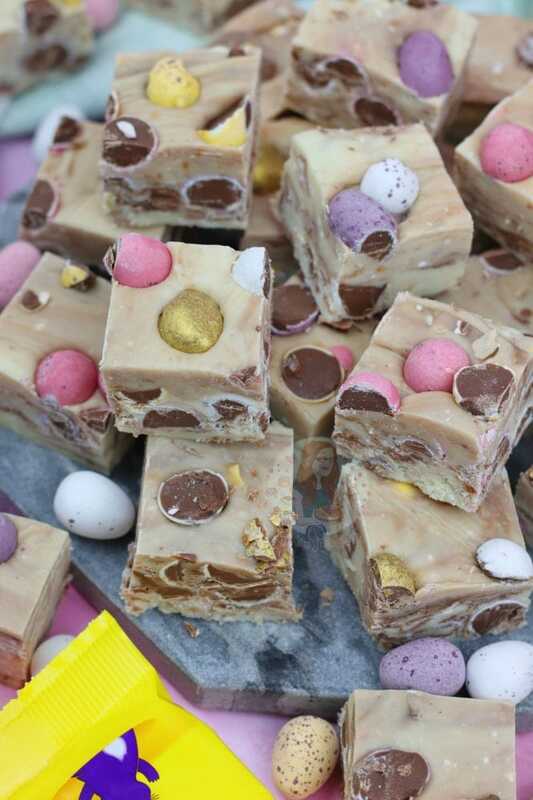 After the success of my Mini Egg Drip Cake, and No-Bake Mini Egg Cheesecake recipes recently, I knew my Easter fudge this year had to be Mini Egg related. The recipe itself is based on my other ‘cheats fudge’ recipes such as my Peppermint Fudge inspired by Carnations fudge which were big successes in themselves.. so this is a winner. It’s a simple mix of a chocolate, condensed milk and sugar. The darker the chocolate the harder the set, but usually a rule of 400g to a tin of condensed milk is ideal. 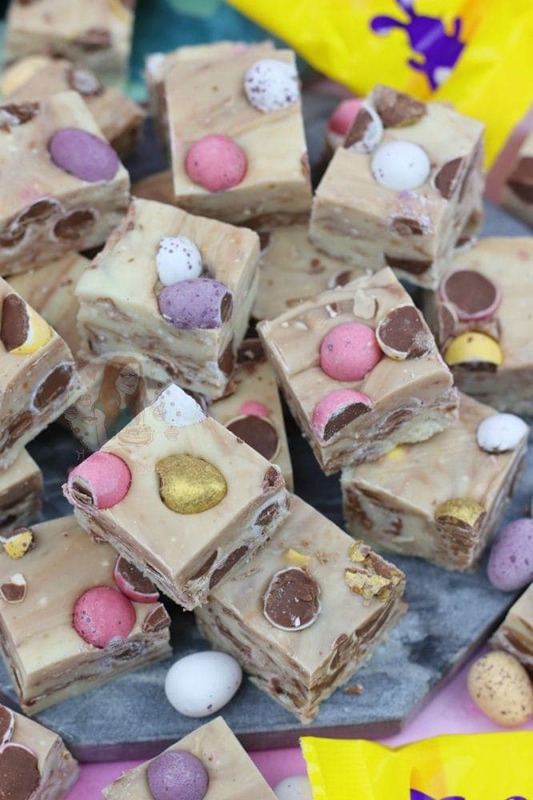 The Fudge itself is white chocolate based as I thought that would make it more Easter-y as its light in colour, and brings out the Mini Eggs well. 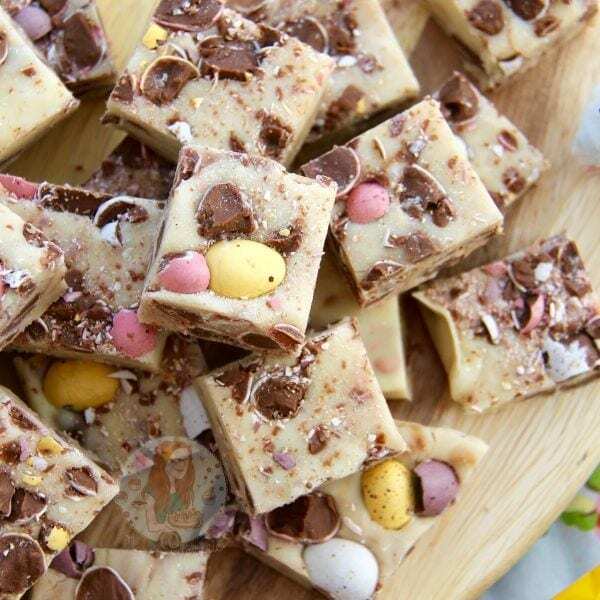 the Crunch of the Mini Egg is delicious against the fudge texture, and of course its super addictive. Some find it sweet, so I cut fairly small squares of fudge so that you don’t feel so bad about eating it.. theres a method in my madness see. I also state below that this can last 2-3 weeks in the fridge, but it NEVER lasts that long in reality. 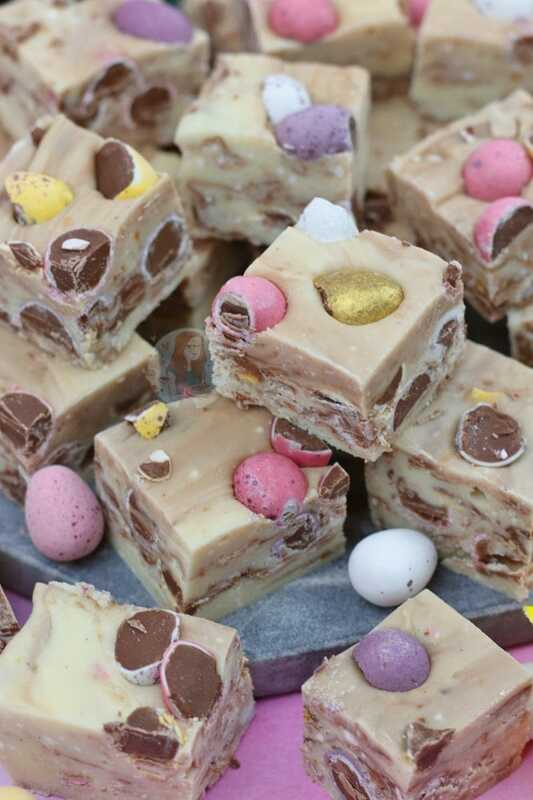 Last year I posted my classic Easter Fudge recipe, which in itself is delicious – and is made like proper fudge.. so if you fancy giving that a go then do, but if you want something easy and quick to make for your Easter sweet treat, then give this delicious recipe a go! Enjoy! Line a tin with parchment paper – I use a 9×9″ square tin as it makes a nice depth of fudge! Put the chocolate, chopped, into a heavy based pan, along with all of the condensed milk, and vanilla extract. Once melted, tip in the sifted icing sugar and combine well, it make take a bit of beating. Leave the mixture to cool for about 5 minutes, stiring occasionally to prevent a skin. Once cooled, pour in 3/4 of the crushed mini eggs and quickly stir through pour into the tin and smooth over the mixture. Pour on the rest of the crushed mini eggs and press into the top of the fudge and store in the fridge for at least 3-4 hours to set, or overnight! This recipe will last better in the fridge for up to 2-3 weeks if it manages to last that long. You can also easily half or double the recipe, the setting times will just change slightly. 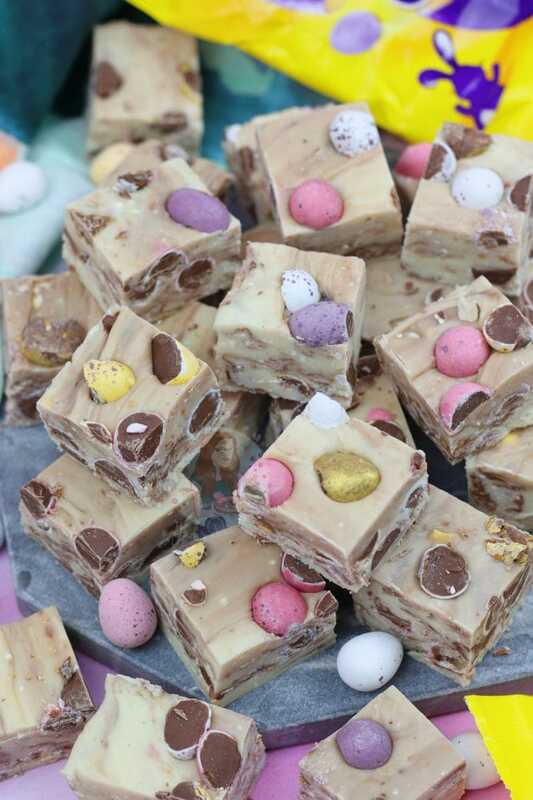 If you don’t let the mixture cool enough, the mini eggs will start melting quickly so don’t worry if they do, it’ll just start marbling the mixture slightly – stop mixing as quickly as you can and set it in the fridge to prevent a mush! You can easily swap the Mini Eggs to any other Easter Treat you fancy! Recipe Update January 2019 - The only changes are it used to have 400g of White Chocolate, and 25g of Unsalted Butter! Find my other Sweets & Easter Recipes on my Recipes Page! Older Next post: No-Bake Creme Egg Cheesecake! Newer Previous post: Custard Cream Cake! Can you swap the white chocolate for milk chocolate ?? I just use a large sharp knife and cut! Ive tried to make this 3 times and it never sets…. what am i doing wrong ??? Are you sure you’re using the correct ingredients? There’s no reason why it shouldn’t set unless the ingredients are different. Thank you! That was my aim 🙂 enjoy!